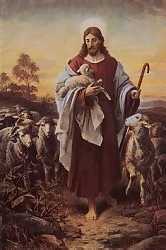 This Fourth Sunday of Easter is Good Shepherd Sunday (so called by reason of the Gospel read at Mass today). Pope Paul VI designated Good Shepherd Sunday as a World Day of Prayer for Vocations, and it still remains this. It is a fitting day for vocations on account of the Gospel for the Mass: The Shepherd knows the sheep, and calls them by name, and they hear his voice and follow him. Pope Benedict XVI, in his message for this day, encourages "faith in the divine initiative", which should lead to confident prayer for vocations, as well as inspire the human response of trusting self-abandonment to the shepherd who calls. He sets forth Jesus as the supreme model of complete and trusting adherence to the Father's will, the model to whom every consecrated person must look. Also exemplary is the Blessed Virgin Mary's generous "Amen" to God's plan told her through the angel.